In today's recruiting world applicant tracking systems do much more than just track applicants. They can be extremely beneficial to your recruiting process. If you've been on the fence about investing in an applicant tracking system (ATS), then this article is for you. We've compiled the 10 major advantages to using an ATS that we think you should know about. One of the best things of an applicant tracking system is that it allows for improved communication within your recruiting team and with others who are involved in your recruiting process. 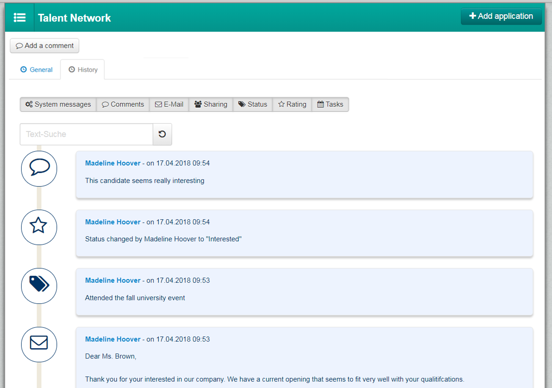 Easily send messages about specific applicants that are accessible to multiple people or assign tasks with a timeline. In addition, all team members can leave notes, ratings, and update an applicant status, so that everyone on the team can check in and share the same up-to-date information. In an applicant tracking system, you can clearly view all of the applicants history and make an informed decision that will be accessible to all team members. 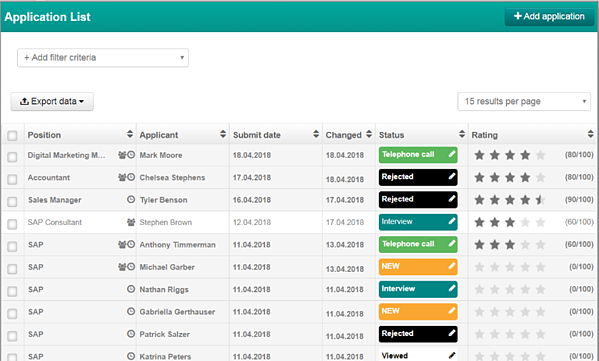 Being able to view the entire teams comments, ratings, and communication with the applicant allows for a transparent decision making process. You don't have to worry about information being lost or misplaced, but can easily access it in one place, creating a faster decision making process. In today's passive job market, an attractive employer brand has never been so important. A strong employer brand can make the difference in convincing a passive candidate to join your company. With an ATS, you can measure, analyze, and improve your employer branding strategies. For further information on how to strengthen your employer brand, check out our "Ultimate Guide to Employer Branding" here. Is there anything in the workday more valuable than time? Saving time means saving money and also creating opportunities for new areas of growth. By storing all information from the recruiting process in one place, an ATS eliminates the possibility of double-work and prevents tasks from stalling due to lack of information. You no longer need to spend time hunting down information or uploading files into multiple different storage areas. By storing all of your applications in an applicant tracking system, you have all the information you need in one place. You can quickly move between applications, compare candidates, update a candidates status, filter candidates, and search candidates, without having to leave the system. Additionally, you eliminate the possibility of an application getting lost or getting stuck on the desk of one team member and you will be informed of any duplicate applications. Upload your jobs automatically and share them on various job exchanges, social media, individual channels, etc. with just a few clicks by using an ATS. You no longer need to manually set up an account with each individual channel and worry about keeping track of each one separately. Also, you will be able to see the success of the advertisements and channels through the analytics gathered in the ATS. Are you frustrated by the bounce rate of your job advertisements? Or maybe you aren't even sure what the typical bounce rate of your advertisements is. An applicant tracking system is an easy solution to better understanding the success of your job advertisements and how to change them for better results. Using an ATS can help you to increase the time spent on the application page and also increase the number of applications. Read more about improving bounce rate on advertisements here. A key aspect of any recruiting process is the budget. But if you don't have a way to analyze all of the aspects of your process, can you really spend your budget in the right way? For instance, you likely send your job advertisements to multiple channels, but which one is the most successful? If you know facts like these, you will be able to better allocate your budget to the right channels, keywords, and target groups. An often overlooked aspect of recruiting is expanding your reach online and in today's digital world, this is a pretty big mistake to make. SEO is a big part of the success of your advertisements and your companies career page. An applicant tracking system makes it possible to analyze and optimize your SEO techniques. Data privacy is the current hot topic in recruiting. With the new GDPR laws being implemented in Europe, and data protection as a whole becoming more scrutinized globally, it is essential to have a way to legally and effectively handle your sensitive data. An applicant tracking system that is compliant with GDPR laws can be a huge stress reliever for recruiters that aren't sure how to deal with data on their own.